Taliat, Arina, Alsoha, Dwight and I enjoyed dinner conversation about the score from Dr. Zhivago that Taliat had produced for his youngest daughter’s Broadway auditions for upcoming college entrance auditions. Arina Demina, who we met in 2015, is now a civil lawyer at Uvemo—a holding company in the vending machine industry in Russia and the UK. IN 2015, when we were here she had just graduated law in Moscow and was studying her Bar. She is off to Norway on Saturday for a camping trip. Her mother Elena is associated with the show Stellar Duo, which is why Alosha, Dwight and I are here. I asked at dinner how many calories beluga caviar has, and no one knew. 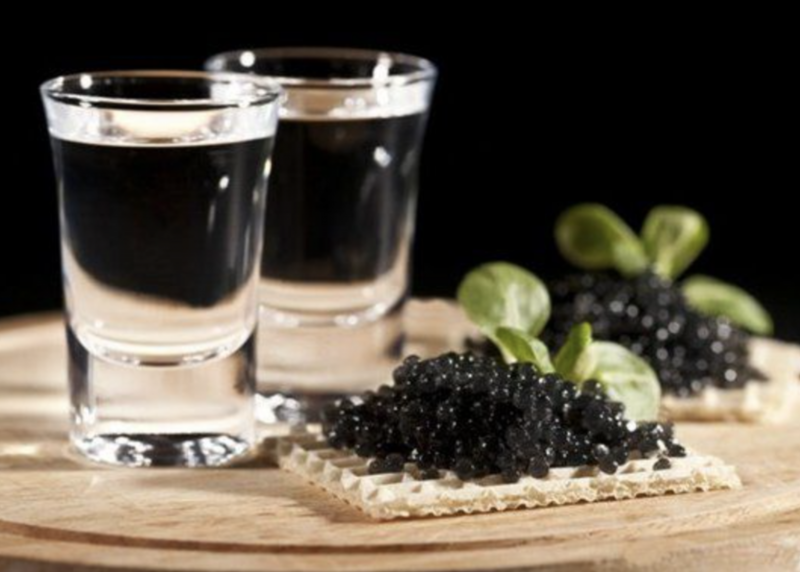 Taliat offered that the oils of the caviar coat your stomach allowing you to drink more vodka shots without feeling the effects of the alcohol. I looked calorie counts up when I got back to Metropol, and luckily, caviar is only 42 calories per Tablespoon. Probably the little caviar spoons would have three scoops to make one Tablespoon. Whew, since I dance Thursday! A jigger of vodka has 97 calories. Overall, this was a low-calorie dinner! Word of the day is “pectophah,” which means restaurant. Russian is not phonetic, and “pectophah” sounds much like the English word “restaurant.” My menu was in English, and Arina’s was in Russian. Our waiter spoke both quite well. At the end of the meal, our table of friends had a discussion on tipping practices. Arina’s view was small tipping. Taliat said ten percent. The service was so very good, Dwight and I went with the ten percent. A ruble today is .018 US Dollar. The US Dollar is quite good here, although downtown Moscow is expensive. Now, we are off to a coffee cantata at Helikon!